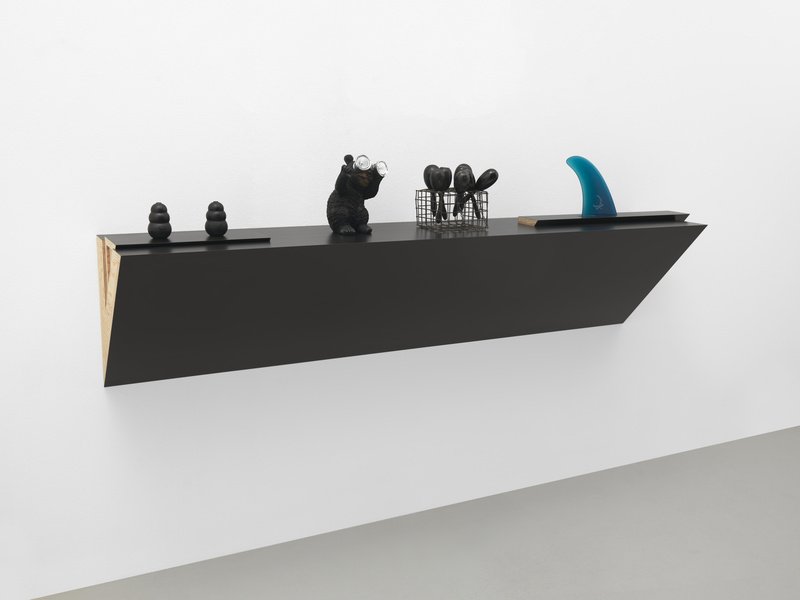 White Cube is pleased to present an exhibition of works by American artist Haim Steinbach (b. 1944) at Mason’s Yard. 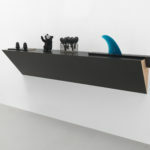 jaws consists of a new series of shelf works as well as the major installation Display #15 – Design for a Yogurt Bar, first made in 1981, which has been reconfigured for the gallery space. Drawing on cultural models from the 1970s and 80s – in particular changing ideas of leisure and health – the works in the exhibition cultivate new and unexpected meanings through their juxtaposition. Objects are ciphers in Steinbach’s practice. Each with their own particular identity, story or history, their meanings and associations rely on the ‘contingency of their placement’, which is always subject to change. 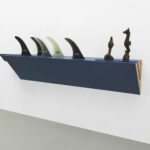 The artist also often re-contextualises his earlier works to adapt them to new sets of spatial and social conditions. 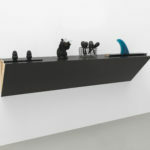 Steinbach considered the idea of ‘display’ as a format within his practice towards the end of the 1970s, partly in response to the prominence of installation-based art at the time. 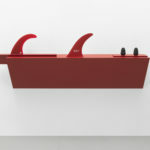 One of the first was Display #7, conceived in 1979 for Artists Space in New York, where he chose to install various objects borrowed from family and friends in the gallery’s reception area, rather than the exhibition space itself, since it formed the nexus of social and spatial activity. Display #15 – Design for a Yogurt Bar was originally realised for Berkshire Community College in Pittsfield, Massachusetts. A room-sized art work, it includes a spray painted wall and a hand-crafted shelf on which sits a group of objects: a wooden doll’s chair, a potted flower and a Moroccan coffee pot. The title of the work not only points to the rise of the frozen yogurt bar during the 1980s, but also to the cultural transformation of yogurt itself, once a foodstuff primarily consumed by near-Eastern immigrant communities, now an ubiquitous, readily available supermarket product. Constructing an intimate space, the display evokes a feeling of ambiguous domesticity, enhanced by its striking ‘graffiti’ wall painting, whose design was taken from Häagen-Dazs ice cream pots, adding complexity to the relationship between object/architecture/artwork/viewer. 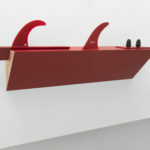 The historically specific model of health and leisure that Display #15 – Design for a Yogurt Bar alludes to is continued in Steinbach’s new series of shelf works, which present numerous surfboard fins in different shapes and colours – either singly or in groups – in juxtaposition with other objects. 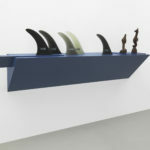 Placed on shelves made of conjoined parts, these upright surfboard fins recall those of a shark, syncopating a cultural archetype of surf and beach culture with a reflection of our primal fears. 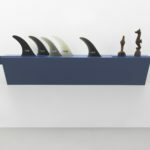 In Untitled (5 fins, dolphin, sea horse), for example, several fins in various shades of white to black are presented next to a dolphin and a seahorse, while in another work, a single blue fin appears like a full stop after a series of objects placed in a line. Like words in a sentence, these objects engender a flow of metonymic associations, highlighting the fundamental role of context and repetition within the artist’s practice. ‘Repetition also has to do with timing, and timing in a rhythmic way has something to do with counting, spacing and memory. These all play into each other and prompt us to think’, Steinbach has said. 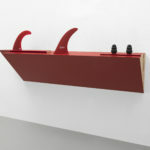 The shelf has been present as a structuring method in Steinbach’s work from the late 1970s onwards. 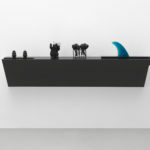 Steinbach sees it as a paradigm, a ‘device for visualising the organisation and distribution of objects.’ In a similar way to Display #15 – Design for a Yogurt Bar, where architecture, shelf and objects all form part of one continuous artistic process, Steinbach’s shelf works bring about a tension between the role of art and the kind of temporal displays people might assemble at home. Inviting a second look, he asks the viewer to question their perceived understanding of things and address the subjective, culturally determined act of looking. jaws opens at White Cube Mason’s Yard on 27 October 2017 and continues until 20 January 2018.